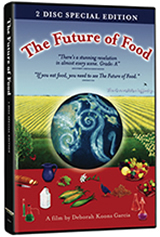 The Future of Food. $24.95 plus $6.00 for S/H. For each additional DVD add $1.50 for S/H. Two disk set. Running time: 90 min.